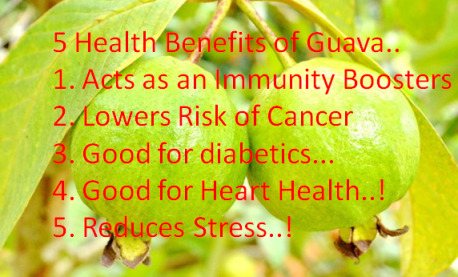 5 Health Benefits of Guava..
Guavas are a rich source vitamin c even more than oranges. Vitamin C is the vitamin associated with improving immunity. Guavas contain a high source of antioxidant lycopene, Guava leaves help fight cancer. Guavas have a low glycemic level making it a good fruit to control diabetes. Guavas are a rich source of fibre which ensures the sugar levels are well maintained. here are a few more article related to diabetes on Pocketnewsalert.com. 4. Good for Heart Health..! Guavas improves the sodium/potassium balance in the body, in turn regulating the blood pressure levels. Guavas help in reducing bad cholesterol levels. The rich magnesium content in Guavas help in relaxing your body and mind. So after a long day at the office, a guava is one thing that you need to relax your body, fight stress and give your system a good energy boost.